The blog will be back to its home in rural western New York in a few days. Of course the heatwave is predicted to break just as I leave. Currently we are still dripping and sweltering and fanning ourselves with anything that comes to hand, sleeping with ice packs instead of hot water bottles and in one friend's case, in her back garden. "Put your bed socks in the fridge" a newspaper said helpfully. Bed socks? In this weather? Britain isn't geared up for high temperatures. A few trains are air-conditioned; most are a rolling steam bath. I never thought I would miss American air conditioning, usually the bane of my life. 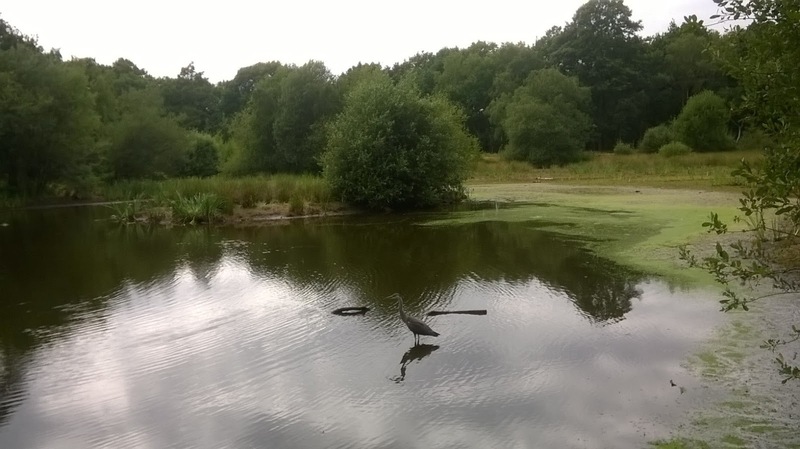 This picture of a heron on Wimbledon Common was taken a couple of weeks ago. Now it's just a patch of mud, the heron still picking his way around looking for snacks in the goo. Meanwhile the weather seems to have affected London life in more ways than one. The other day I walked down South Molton Street and Bond Street - at one time pleasant shopping areas, to be accosted every few yards by someone yelling aggressively from one or other of the shops, "Madam! ", thrusting free samples at me and trying to entice me in to spend money. Just like those little boys in Turkish and North African soukhs and carpet bazaars used to rush after me shouting "Special price, for you, Madam,special price!" Must be the heat.